Calls For Resignation As Va. 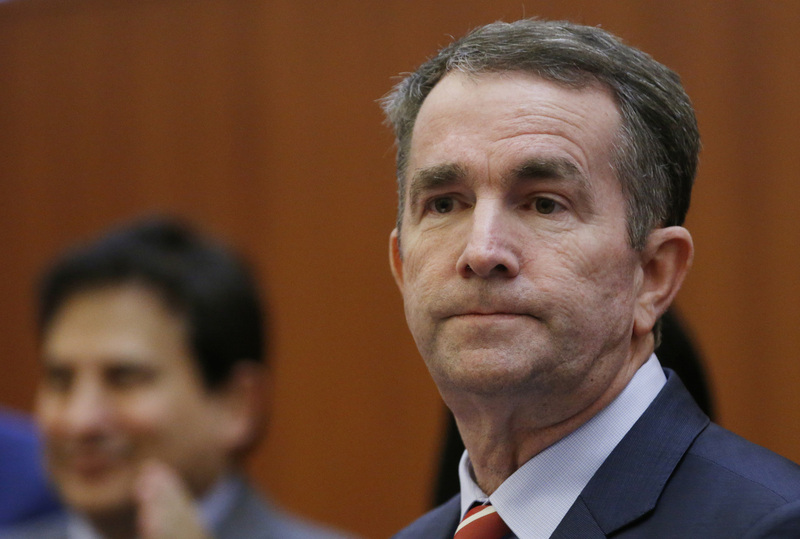 Governor Apologizes for Racist Image In 1984 Yearbook Ralph Northam, a pediatric neurologist and Democrat, was elected in 2017. The photo shows a person wearing blackface standing next to another person wearing a Ku Klux Klan robe. 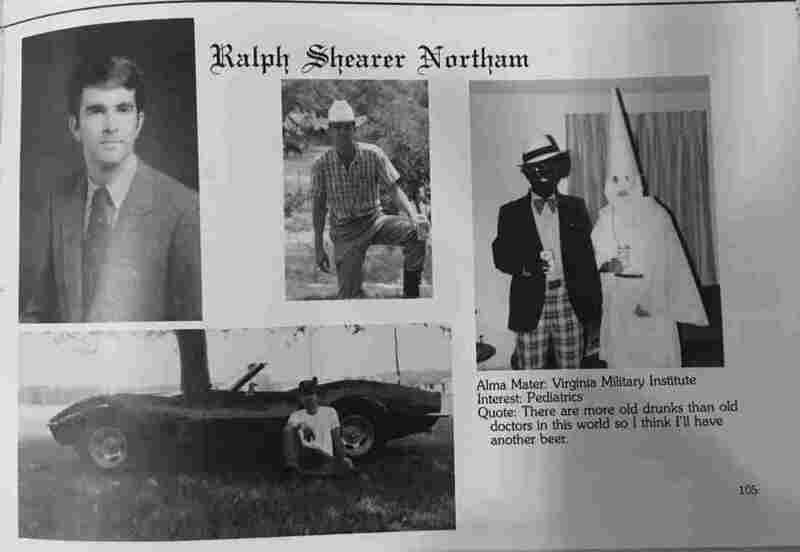 Ralph Northam's page in the 1984 yearbook of Eastern Virginia Medical School in which two people are wearing blackface and a KKK costume. Virginia Gov. Ralph Northam apologized on Friday for appearing in a "clearly racist and offensive" costume in his 1984 medical school yearbook. The photo shows a person wearing blackface standing next to another person wearing a Ku Klux Klan robe. Criticism from the right and left mounted Friday night, including calls for the governor to resign. Northam, a Democrat, said in a statement: "I am deeply sorry for the decision I made to appear as I did in this photo and for the hurt that decision caused then and now." He also tweeted a video apology, saying the behavior from his past "falls far short of the standard you set for me when you elected me to be your governor." "I am ready to do the hard work of regaining your trust," he said. Northam didn't specify which of the people in the photo was him. The page features his name, his undergraduate alma mater and his interest in pediatrics. The page includes a montage of photos, including one of Northam in a jacket and tie and another in which he is wearing a cowboy hat. Northam graduated from Eastern Virginia Medical School in Norfolk, Va.
Virginia House Democrats are calling for Northam's resignation. "We are so deeply saddened by the news that has been revealed today," they said in a statement on Friday. "We regret to say that we are no longer confident in the governor's representation of Virginians. Though it brings us no joy to do so, we must call for Governor Northam's resignation," the party's statement said. The Republican Party of Virginia is also calling on the governor to resign. "What Ralph Northam did was unforgivable," the party said via its Twitter page. "Given his statements on the right to life coupled with the most recent revelations, he has lost the moral authority to continue to govern and should resign immediately. " Virginia Gov. Ralph Northam, pictured preparing to address a news conference on Thursday, issued an apology for a racist photo on his medical school yearbook page. Northam's office released a statement from the governor on Friday evening, apologizing for the image. "I recognize that it will take time and serious effort to heal the damage this conduct has caused. I am ready to do that important work. The first step is to offer my sincerest apology and to state my absolute commitment to living up to the expectations Virginians set for me when they elected me to be their Governor," he said. There are many more calling for Northam's resignation. "Black face in any manner is always racist and never okay," said NAACP President Derrick Johnson in a tweet. "No matter the party affiliation, we can not stand for such behavior, which is why the @NAACP is calling for the resignation of Virginia Governor @RalphNortham." "If @RalphNortham is one of the two people pictured in the highly disturbing, horrific photo wearing either blackface or a KKK hood – or if he selected or approved of its use on his yearbook page — he should immediately resign. There are no excuses for such a racist display."